Funny find someone who that will get your class talking and laughing. Great for all ages. If they find the person they get some points. At the end the person who has more points wins. Great for large classes. Have fun. Thank you Elizabeth for the template. 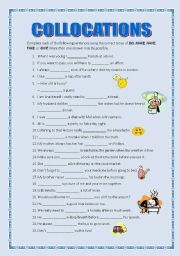 This is a worksheet to help students with similes. Key included. Hope you like it! 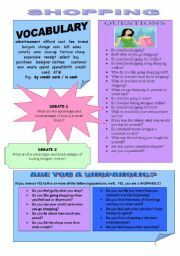 Speaking activity on shopping with vocabulary, 2 debates, questions and a quiz. Hope your students enjoy it. 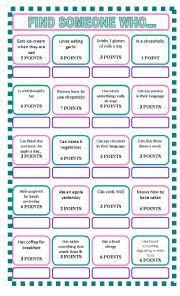 Worksheet to review some vocabulary and expressions on money. 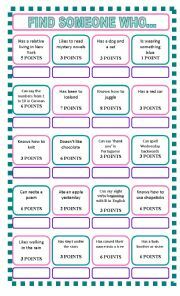 There is also a speaking activity with some fun questions. Hope you enjoy it!!!! Funny find someone who game about food and eating. Thank you Elizabeth for the template. Hope you enjoy it! 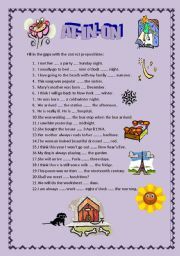 Worksheet to review prepositions at in on. Hope you like it! 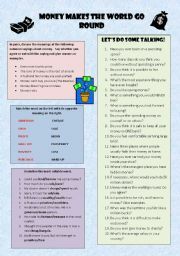 Collocations using have, give, take, do and make. 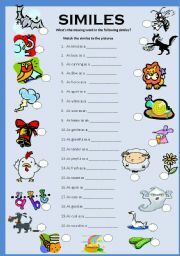 Students must fill in the gaps using the correct verb and tense. KEY INCLUDED! Hope it�s useful! 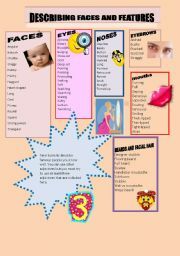 Words to describe faces. Includes a speaking activity/game where students have to describe famous people and there partners try to guess. Hope you enjoy it! Students speak about the advantages and disadvantages of living in the city or country and then decide on advice to give to a friend. Hope you like it.